Welcome to The Sci-Fi Dominion! Welcome to The Sci-Fi Dominion! 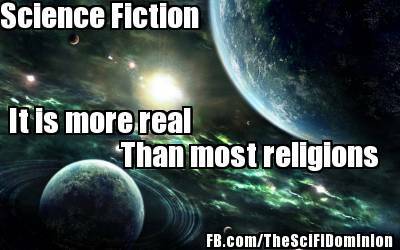 This blog will cover a broad genre, science fiction as well as fantasy and horror. It will attempt to keep up with current science fiction in tv and movies while reminiscing on wonderful shows from the past. A few years ago I ran my own website, it was niche search engine for science fiction that had over 1600 websites in its directory, making it the 3rd largest scifi directory in existence at the time. Google was also getting into its groove at the time and my sci-fi directory was ranked #1 in its category. I was very proud of it, but couldn’t keep up with all the work needed to maintain it. It was huge undertaking for something that was supposed to be just a hobby so I had to let it go. I have always wanted to get back into it though and I think this blog will be a nice, workable way of doing that. 😀 Especially with so much going in science fiction right now, the Star Trek reboot, Star Wars is about do another set of movies. I wish this blog had been around for Farscape, Babylon 5 and the re-imagined BattleStar Galactica, too! Well, it will be around for the next big things to come up!! And don’t forget to like our Sci-Fi Dominion FaceBook Page! Not to get too political, but….